The Princess Royal's  bridal dress was of white moire antique, the body trimmed with Honiton lace, and a bouquet of orange flowers and myrtle. The petticoat, trimmed with three flounces of Honiton lace, wreathed with orange and myrtle, and the train of white moire antique lined with satin, bordered with a ruche of white satin ribbons, Honiton lace, and a wreath of orange flowers and myrtle to correspond with the dress. Diamond necklace, earrings, and brooch; the Prussian order of Louisa , and a Portuguese order . The head dress a wreath of orange flowers and myrtle; the veil of Honiton lace, to correspond with the dress. The design of the lace is alternate medallions of the rose, shamrock, and thistle, with a rich ground of leaves of the rose, shamrock, and thistle. The Princess of Prussia  wore a white silk dress with silver worked flounces, a diadem of diamonds, feathers, and a lace veil. The train of blue moire antique, shot with silver, and embroidered with silver. Necklace pink topaz and diamonds. Her Royal Highness the Duchess of Kent  wore a petticoat of white moire antique brocaded with violet and trimmed with point lace. The train violet velvet trimmed with ermine; the stomacher violet velvet, with ornaments of diamonds and amethysts . The head dress was formed of white ostrich feathers, diamonds, amethysts, and point lace. The materials of the dress and train were of Spitalfields manufacture. The Duchess of Cambridge  wore a lilac silk dress, with double skirt, both skirts trimmed with bouillonnes of tulle and Honiton lace; the train lilac moire antique trimmed with ermine. A stomacher of diamonds and pearls; a necklace of diamonds. Her Royal Highness's head dress was composed of a tiara of large pearls  and white feathers, with a veil of Honiton lace pendant from the back of the head. The Princess Mary of Cambridge  wore a double skirt of blue crepe over a glace silk petticoat ornamented with blush roses and ruches of crepe and blue satin ribbon, with two very deep flounces of Brussels lace. The train, blue moire, trimmed with Mechlin lace, blush roses, and ruches of tulle to match the dress; the body trimmed to correspond with the train. Diamond and pearl stomacher. A diamond necklace. The princess's head dress was formed of a diamond diadem , white feathers, cappets of Brussels lace, and diamond ornaments. 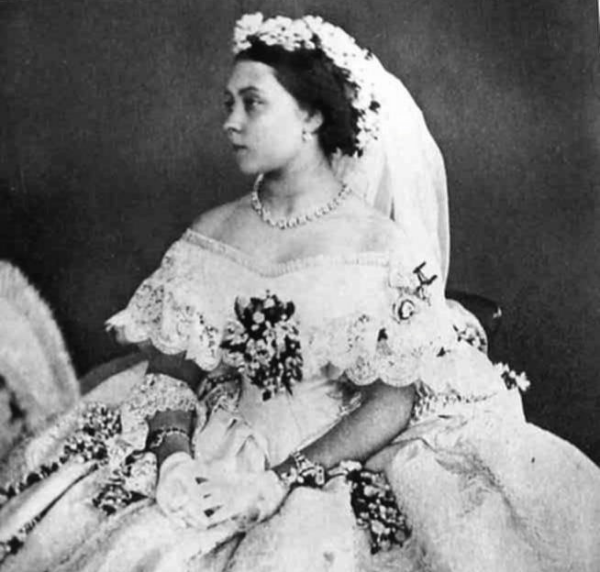 The Princess Alice  wore a dress of white lace over rich pink satin trimmed with cornflowers and daisies. 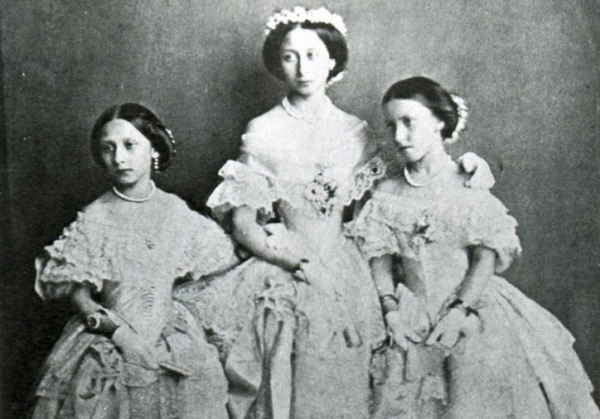 The Princesses Helena  and Louisa  wore dresses similar to that of the Princess Alice, with cornflowers and daisies in the hair. 1. Queen Victoria of the United Kingdom (1819-1901), mother of the bride. The Princess Royal was the eldest child of Victoria and her husband, Prince Albert of Saxe-Coburg and Gotha. 2. The Koh-i-Noor Diamond came into the Royal Collection in 1849, when it was ceded to Queen Victoria in the controversial Last Treaty of Lahore. (Lawsuits are frequently filed by parties who believe it was wrongly taken by the British and should be returned to Asia.) It was displayed at Prince Albert's Great Exhibition in 1851, and in 1852, Albert had the stone recut, reducing the size from 186 to just over 105 carats. Today, the diamond is set in the crown of the late Queen Mother, and it can be viewed in the crown jewel exhibit at the Tower of London. 3. For her daughter's wedding, Victoria wore the grand Diamond Diadem that had been made for the coronation of her uncle, George IV. 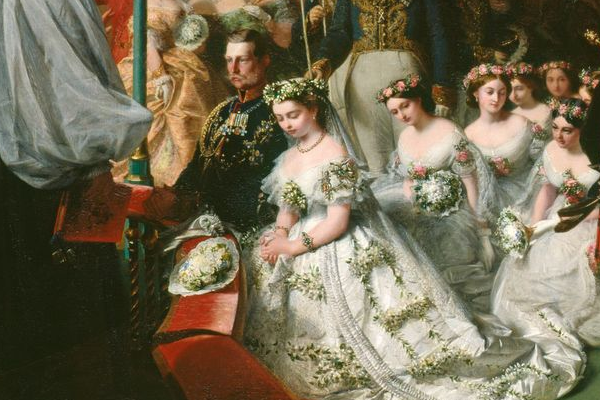 Shortly before this wedding, Victoria had lost a number of jewels to her cousin, King George V of Hanover (see here for more). Hugh Roberts notes that the loss was a "serious blow" to Victoria. She was reportedly consoled by the fact that she was able to keep this diadem and wear it at her daughter's wedding. 4. Princess Victoria ("Vicky"), Princess Royal (1840-1901), later German Empress and Queen of Prussia, was the eldest child of Queen Victoria and Prince Albert. She married Prince Friedrich of Prussia, the future emperor of Germany, in 1858. They had eight children, including Queen Sophie of the Hellenes and the infamous Kaiser Wilhelm II of Germany. 5. The Order of Louise was a German order of chivalry created by King Friedrich Wilhelm III of Prussia to honor his late wife, Louise of Mecklenburg-Strelitz. 6. Not sure which Portuguese order, if any, Vicky had. She did have a Spanish order, the Order of Queen Maria Luisa. 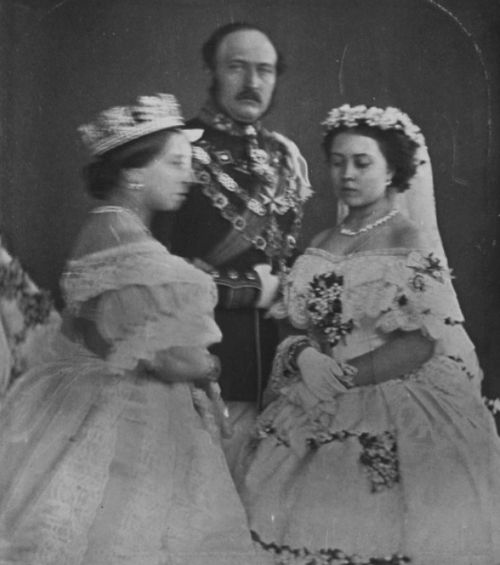 In the photographs of Vicky from her wedding day, the Order of Louise is visible on her shoulder beside at least one additional order, the Royal Order of Victoria and Albert. 7. Princess Wilhelm of Prussia (1811-1890), later German Empress and Queen of Prussia, was born Augusta of Saxe-Weimar-Eisenach. Her son, Prince Friedrich Wilhelm of Prussia, was the groom at this wedding. Her daughter, Louise, married the Grand Duke of Baden; they were the parents of Queen Victoria of Sweden. 8. The Duchess of Kent (1786-1861), born Princess Victoire of Saxe-Coburg-Saalfeld, was the mother of Queen Victoria and the aunt of Prince Albert. She was both the grandmother and the godmother of Princess Vicky. 9. The Duchess of Kent owned at least one gorgeous suite of diamond and amethyst jewels: the Kent amethysts, which are owned and worn today by Queen Elizabeth II. 10. The Duchess of Cambridge (1797-1889), born Princess Augusta of Hesse-Kassel, was the wife of Queen Victoria's uncle, Prince Adolphus, Duke of Cambridge. She was also the grandmother of Mary of Teck. 11. 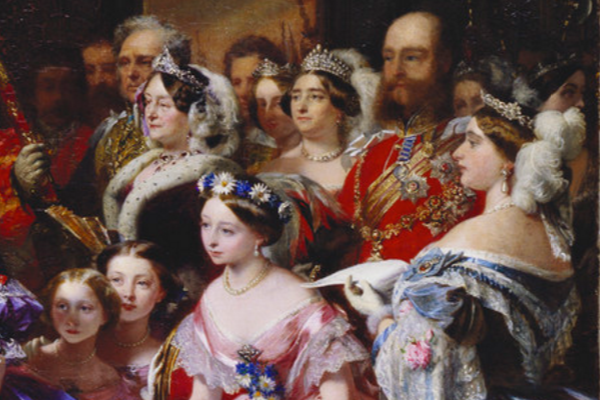 Augusta wore the famous Cambridge Lover's Knot Tiara to this wedding. 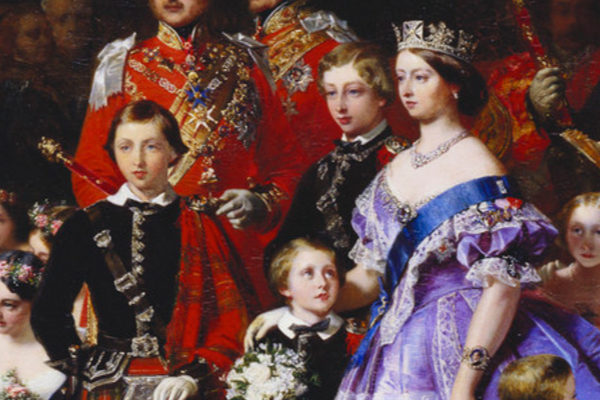 The tiara is clearly visible in the John Phillip painting of the ceremony. 12. Princess Mary Adelaide of Cambridge (1833-1897) was a first cousin of Queen Victoria. Her parents were Prince Adolphus, Duke of Cambridge and Princess Augusta of Hesse-Kassel. In 1866, Mary Adelaide married Prince Francis of Teck, a member of the royal family of Wuerttemberg. They were the parents of Mary of Teck. 13. 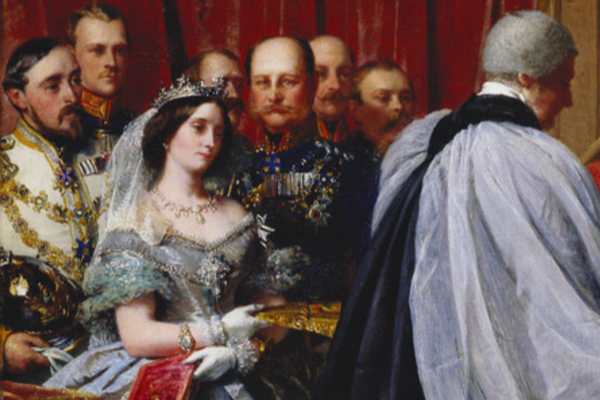 In the painting of the wedding by John Phillip, Princess Mary Adelaide is clearly wearing the Teck Crescent Tiara, identified by its distinctive crescent-and-rose pattern. She had inherited the diamond piece from Princess Mary, Duchess of Gloucester, only a few months before. 14. Princess Alice of the United Kingdom (1843-1878), later Grand Duchess of Hesse and by Rhine, was the second daughter of Queen Victoria and Prince Albert. Her descendants include Empress Alexandra Feodorovna of Russia, Queen Louise of Sweden, Lord Mountbatten, and the Duke of Edinburgh. 15. Princess Helena of the United Kingdom (1846-1923), later Princess Christian of Schleswig-Holstein, was the third daughter of Queen Victoria and Prince Albert. She was a major advocate for British nursing. 16. Princess Louise of the United Kingdom (1848-1939), later Duchess of Argyll, was the fourth daughter of Queen Victoria and Prince Albert. She broke with tradition when she married an aristocrat (the Marquess of Lorne, later Duke of Argyll) instead of a royal prince. An accomplished sculptor, her statue of her mother stands outside of Kensington Palace.